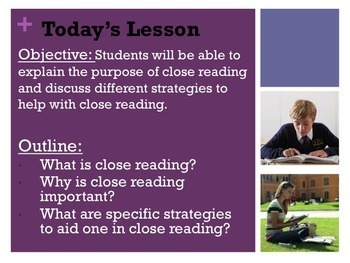 This is a powerpoint presentation that introduces close reading skills of informational texts to students. I created this product last year in order to align with Common Core Standards. 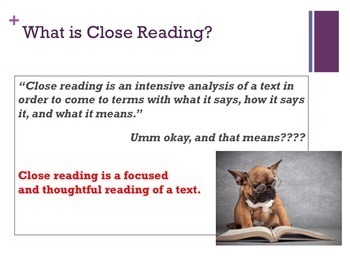 Powerpoint reviews the definition of close reading then outlines the 4 major steps of close reading: START WITH THE END IN MIND, NUMBER PARAGRAPHS, "CHUNK" TEXT, and ANNOTATE. My student feedback has been very positive as this is a structured and straightforward approach to close reading informational texts. 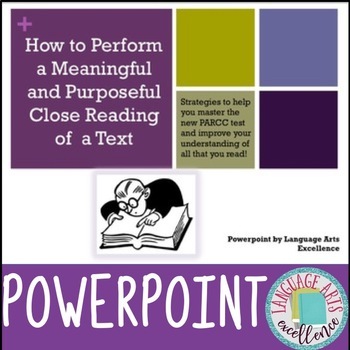 This powerpoint serves as an excellent introduction to the kind of close reading students need to do for the PARCC test as well as for the Common Core. 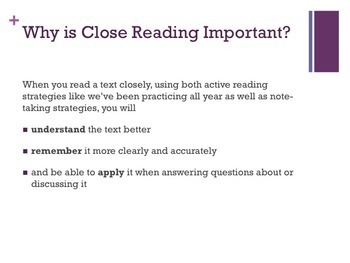 How to incorporate this powerpoint into your own lessons: Begin by introducing close reading skills with this powerpoint. Then, pass out a short article (I find mine at Kelly Gallagher's Article of the week http://www.kellygallagher.org/article-of-the-week) and model the steps with your students. I put the article up on the SMARTBoard and hand out a copy to each student so we can do it together. This full lesson takes about an hour and a half to two hours to fully complete.